I have taken a longer break than I intended in writing this report. Summer is often a quiet time on the river with few anglers to be seen. 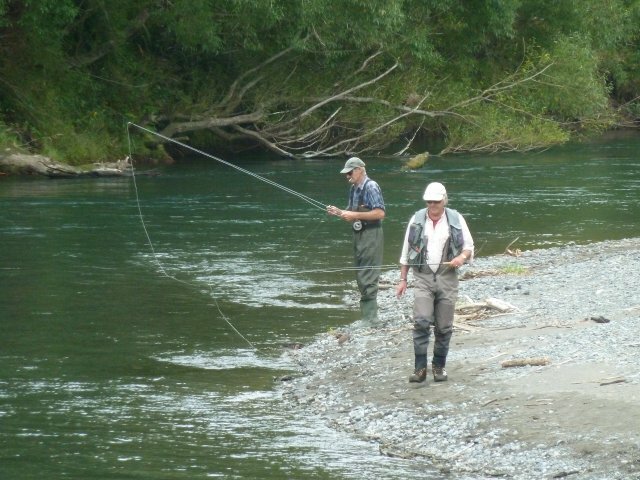 It is however a time when dry fly anglers gain much enjoyment fishing in warmer weather than the cold of winter. It can also be very productive. It is the time when the Brown trout start to move and they are now in the river in numbers. Work by Waikato Regional Council (It was Environment Waikato until Environment was removed and I have to remeber the new title despite the signage on vehicles and property is changed. It makes me wonder why the name change is forced by Central Government on Regional Government with the cost to be born by the ratepayer rather than the taxpayer.) stopped for the Christmas break but is again in full action. We received notice in December of a meeting on developments in the fight against Didymo . Unfortunately none of our committee were available to attend. I am grateful to Didymo Dave for supplying the following report. 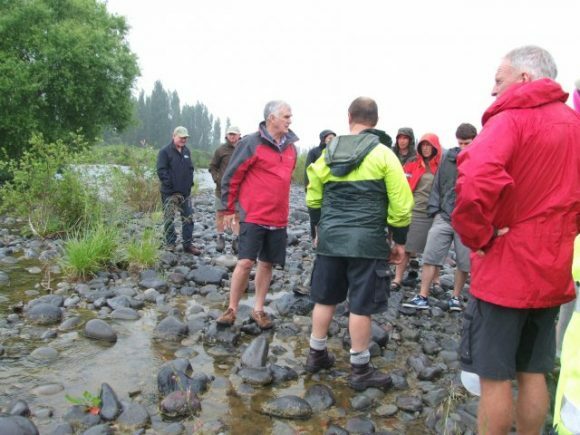 Attached is a photo of Jeff Donaldson (centre in red coat) addressing the advocacy people on the banks of the Tongariro River. 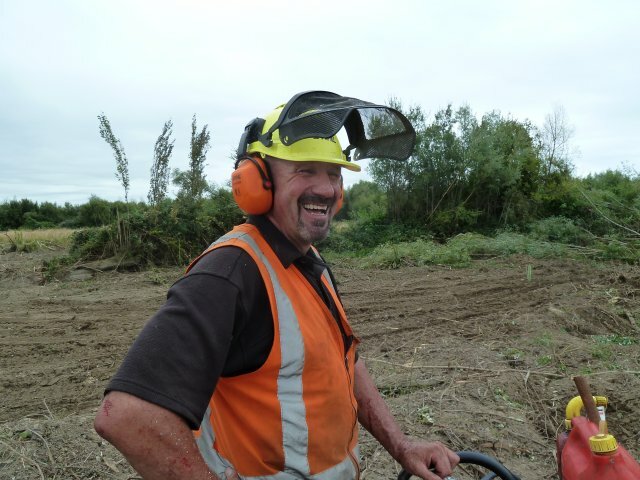 Jeff is operations manager for Didymo, New Zealand and a great person to have on our side. There were 30 people at the North Island training day representing Regional Councils all over the North Island as well as DOC people from Waikaremoana,Taranaki,Turangi,Rotorua and Biosecurity people from Wellington. Subjects covered included an update on all aquatic weeds including Didymo, Lagarosiphon, Hornwort and Alligator weed as well as pest fish. Advocacy tips,tricks and how to fight this battle to keep them out were shared by the more experienced advocacy people. A day of inspiration for us all ahead of the busy festive season with people on holiday boating fishing etc. Willow clearing work on the left bank continued after the Christmas break by putting in an access track from the Reed Pool to deLautours Pool. That track is now close to reaching deLautours Pool and meeting up with the clearance of Willows done 3 or 4 years ago by Ngati Turangitukua. The track is blocked for vehicle access. But the track does give easy access downstream. Here the track crosses the Hirangi Stream. It is worthy to note that the Hirangi Stream starts from a spring close to Hirangi Marae. Another stretch also entering the Tongariro River from the Left bank is the Hirangi Arm which is a bifurcation of the Tongariro at the Swirl Pool and runs parallel to the main course of the river and re enters the river at the Reed Pool. 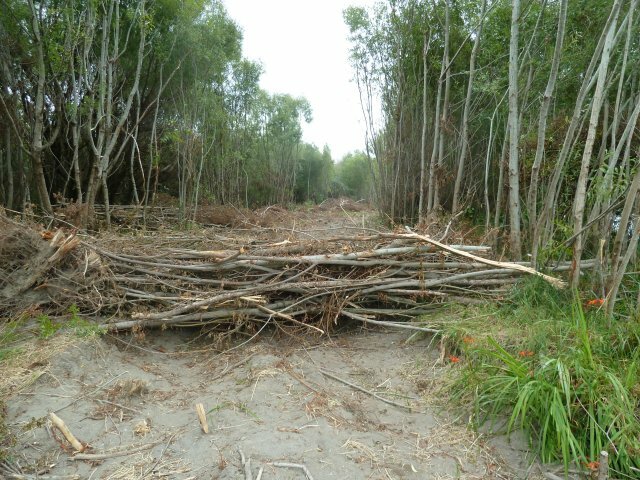 Work is now clearing the willow growth in the area from Smallmans bend to deLautours. All the chainsaw work has been done by Ian Douglas. He has fought the blackberry and the thick growth of willows as he has cut his way downstream. 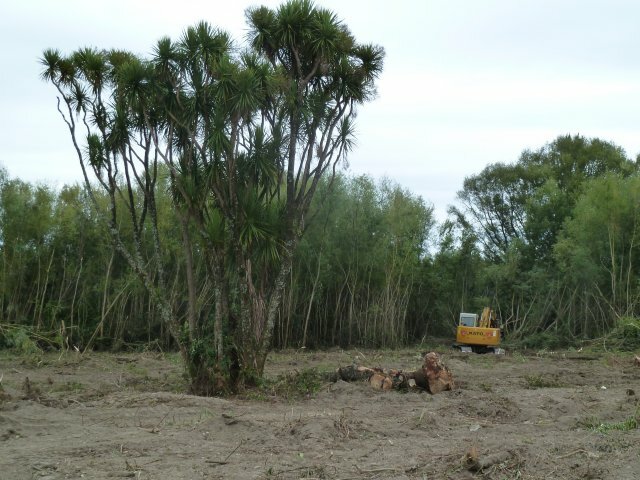 The digger then picks up the felled trees and stacks the vegetation to enable it to be burnt. Part of the project is to remove logs from the river as the logs act as a barrier to the flow causing a build up of sediments around them. 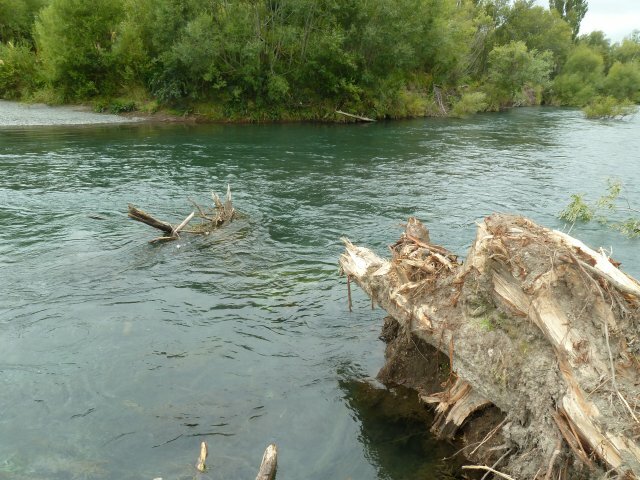 Removal has been difficult at times as many of the logs are embedded into the river bank. 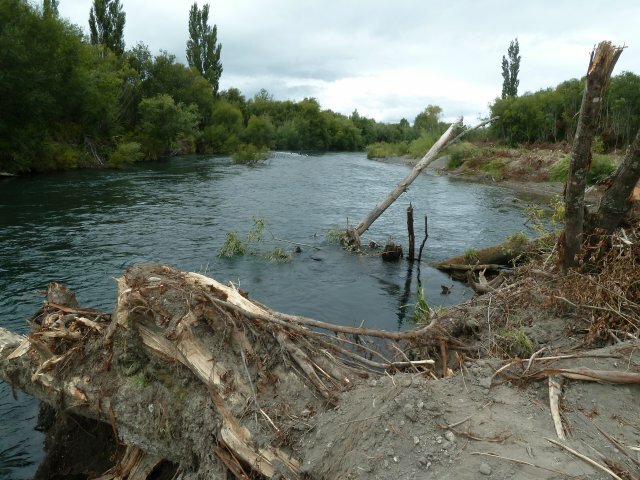 The area between the track and the river will next be cleared and I am assured every effort will be made to get logs out of the river that have so far not been attempted. I have been asked what the purpose of this willow clearance is. I understand that it is to improve the flow of the river in flood. 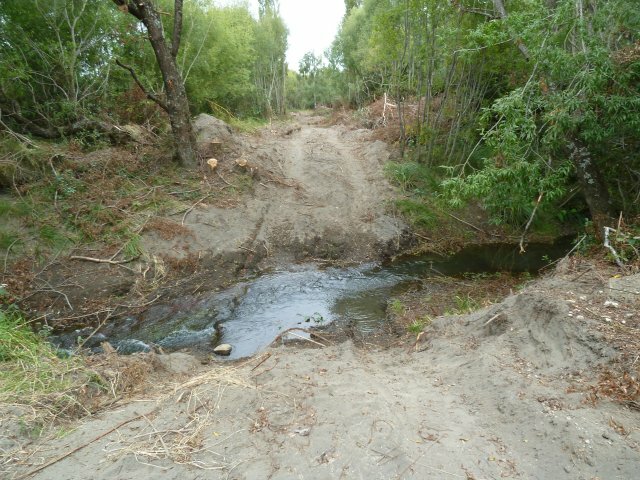 The willows restricted the river to a narrow course which resulted in sediments not reaching the lake. Improved flood flows reduces the risk of flooding in the town. The stumps of willows felled last year have shown amazing growth. I am told that the new growth is in the process of being hand sprayed. 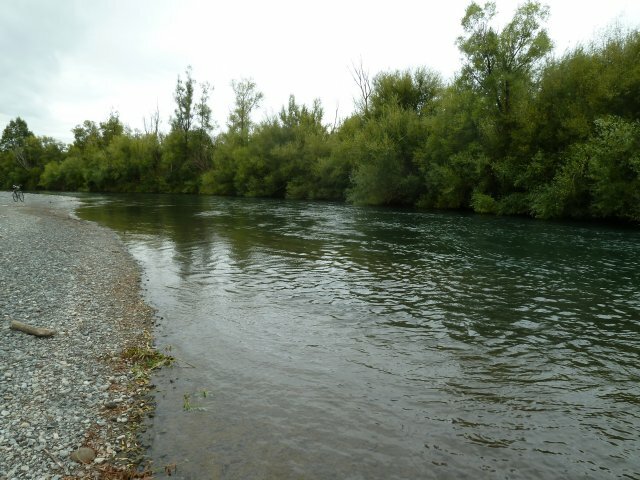 This will be followed by a planned planting of native vegetation that will not restrict flood flows. The summer in Turangi is alive with the sound of Cicadas. 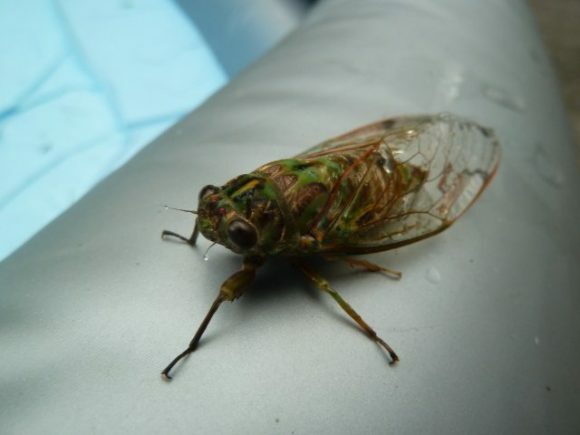 Anglers fishing at this time are finding Cicada flies very effective. These anglers told me that they have been catching fresh run Rainbow trout but they are small, in the vicinity of 2 to 2.5lbs. They also reported that they had not seen as many brown trout and big ones at that as they have this season. Perhaps the Brown trout is the cause of the demise of the Rainbow Trout. Membership forms have just been posted. We value our membrship and look to increase our members.